I don’t eat steak much, but when I do, I really go all out. 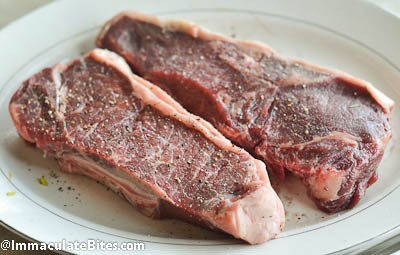 My favorite cuts are New York steak or rib eye, dry aged with marbling. I remember not too long ago eating a well done steak was the norm for me. Any other way and I would have placed myself in the category of a barbarian; this was largely so because of my cultural upbringing- our meat is always cooked well done. Any visibility of red or pink color on your plate would be…. to put it lightly -distasteful. But for a while now, “well done” does not cut it for me. I did a blind taste test and medium tastes—unbelievably good; tender juicy and flavorful. However, my family (husband, brothers, sisters) disagree with this theory. 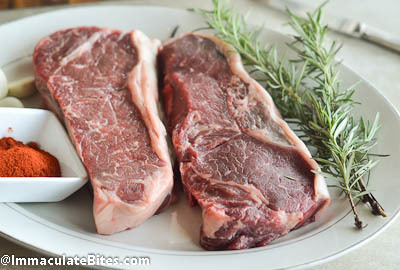 Whenever I grill steak, I cook it medium – pinkish in the center and gray-brown towards the exterior part of the meat. (Reserve a steak for me) and finish the rest in the oven for everyone else- a win- win for everyone! 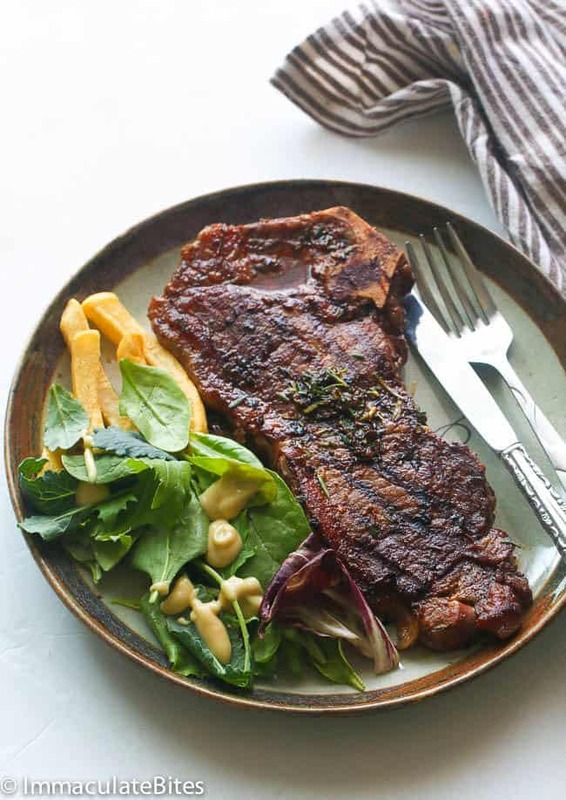 This is a spiced up New York steak that is easy to make. 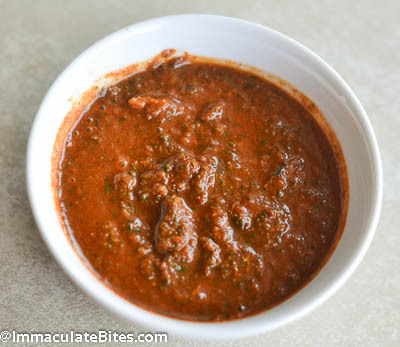 It is seasoned with rosemary, garlic, chili powder, paprika, soy sauce, salt and pepper. 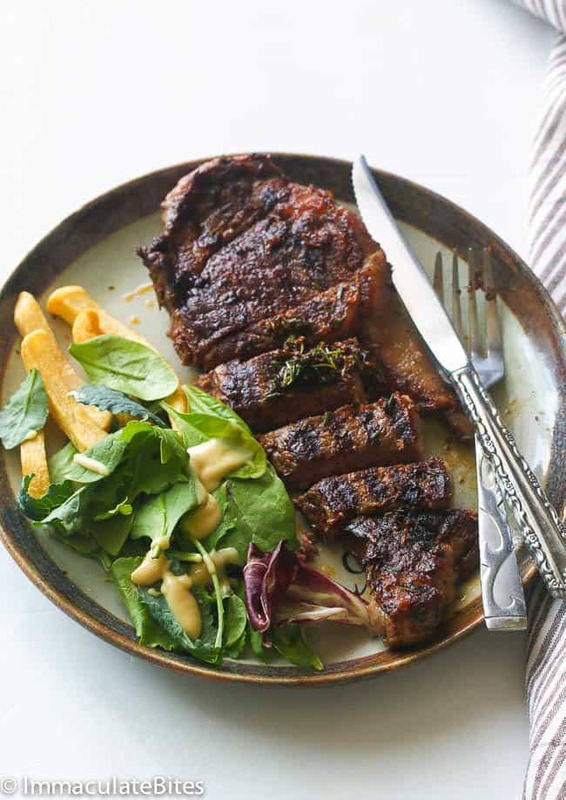 These ingredients are mixed with canola oil to create a paste to marinate the steaks and then grilled over a hot fire to give the steak a richly browned complex flavor. An easier way to make this steak would be to preheat oven at 450. 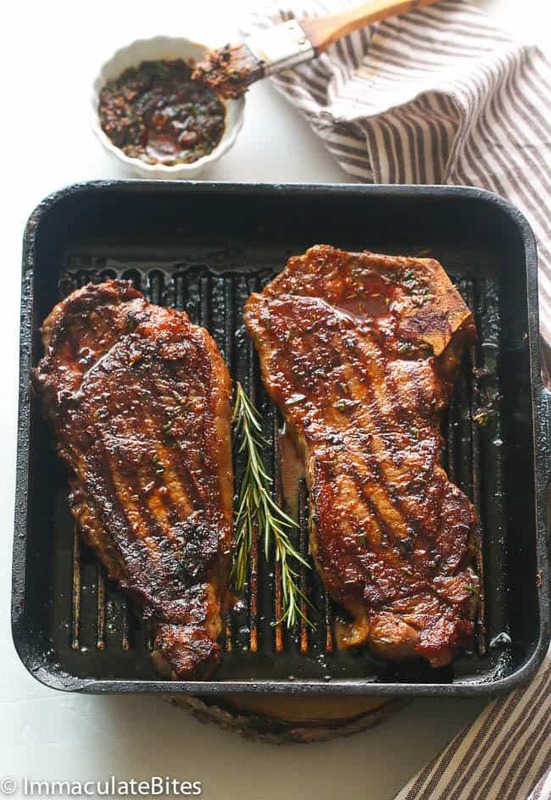 Heat up a skillet or cast iron until it is screaming hot.Sear the steak on 2 minutes on one side, then use a thong and sear all the edges of the steak, lastly place the steak on the un-sear side and finish in the oven to achieve degree of doneness. This may take about 7 minutes for medium or more depending on the thickness of your steak. Let the steak rest for at least 10 minutes before serving to allow the juices to re-incorporate into the meat. 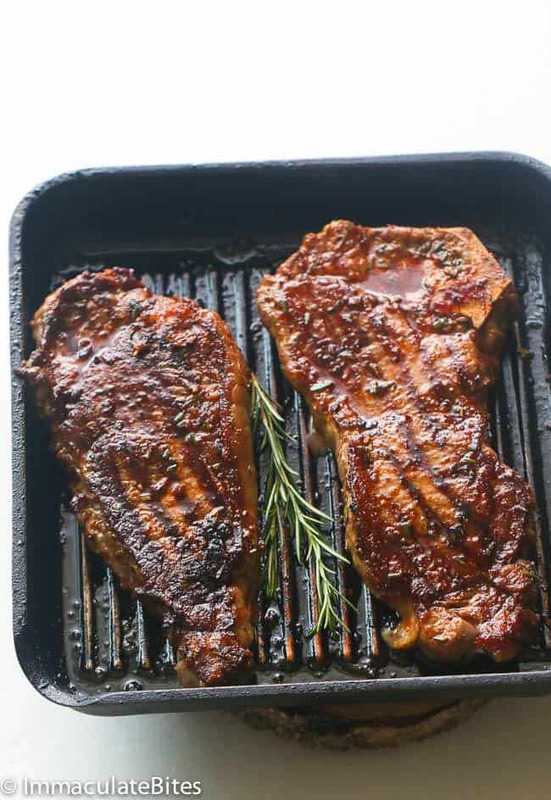 Spicy Garlic & Rosemary Grill Steak- Easy Steak seasoned with rosemary, garlic, chili powder, paprika, soy sauce, salt and pepper. In a food processor, blend rosemary, garlic, paprika, cayenne and soy sauce. 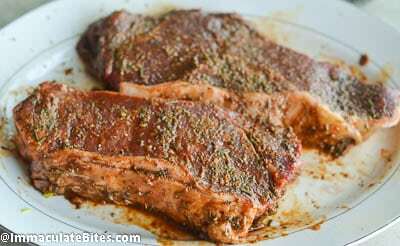 Marinate the steak with the herb mixture for at least 2 hours. Let it rest for 20 minutes before grilling. 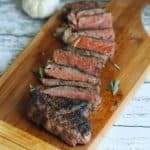 Finish cooking in the oven for medium well for an additional 3 minutes or 150 degrees F.
To cook this steak in the oven follow the instructions above. When the steaks are done to your liking, take them off the grill and let them rest for about 10 minutes. Sounds mm mm good! I’ll definitely be trying this recipe out! Thanks so much for sharing with the world Ms. Imma! Blessings! 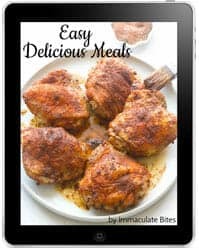 Delicious and exotic recipes. I can’t wait to try out more new recipes! Thanks Henry!! Do let me know which ones you try out.